A while ago we wrote a blog on the new Maximise Conversions bidding strategy , which allowed Google grant users to exceed the $2 bid limit. At the end of that post, we concluded that we’d need more time to test and observe the new system before we could make a decision on it’s usefulness. Well, we’ve had that time, and it’s been a wild ride. For a while Maximise Conversions was doing very little to accounts and, with the Google grant policy changes introduced in December, testing the new bidding strategy took a back seat. This all changed towards the end of January, however, when we noticed Maximise Conversions behaving very strangely. The graph above shows the average cost per click for a campaign over January, and you can see how sudden and extreme the change was. In a matter of days, the cost per click rose from under a dollar to over $20. If anything, conversions have dropped and are definitely not worth the ten times higher bid amount. 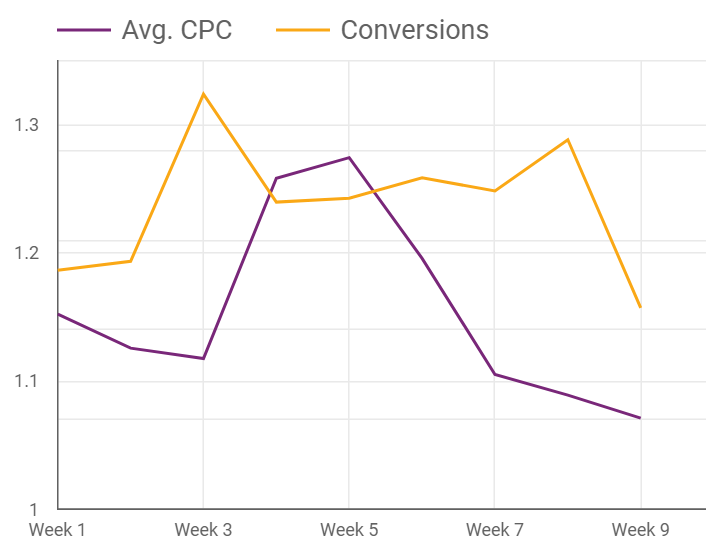 You can see the affect Maximise Conversions has on average CPC by the increase in weeks 4 and 5. There is not, however, an equivalent increase in conversions, which we would expect to see if these users were more likely to convert. In short, the bid strategy was increasing bids without improving user quality. Our belief is that Google Grant accounts were getting into bidding wars with each other. Multiple Grants with Maximise Conversions bidding on the same term caused the accounts to constantly try to ‘one up’ the field, increasing the bids seemingly indefinitely. Our recommendation to all Google Grant holders is to avoid Maximise Conversions for the time being. Google is still making drastic changes behind the scenes to how the strategy works, and until they settle on a suitable level of automation it is too much of a risk to leave running in accounts. We’ll no doubt be blogging again on this topic as we see further developments. In the meantime, if we can help you with getting the best results from your Google Ad Grant, securing an Ad Grant, or any other area of digital marketing please do get touch, we’d love to hear from you!